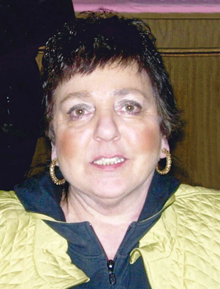 Molina, Anna L. “Babe” (Vaccaro) of Boston's North End passed away on August 16th after a brief illness. Beloved wife of the late Ivan J. Molina. Devoted mother of Ivan A. Molina of the North End. Dear sister of Marie "Ree" Abruzzio (Vaccaro) of Revere, Nicky "Iggy" Vaccaro of Medford, Dolores "Lola" Bonfilio (Vaccaro) of Winchester, Carmella "Chickie" Lynch (Vaccaro) of Stoneham and the late Anthony and Sal Vaccaro. Also survived by many loving nieces, nephews, great-nieces and great-nephews. Family and friends will honor Anna's life by gathering at St. Leonard's Church Hanover St., Boston's North End on Thursday August 30th from 8:00AM to 9:45AM. A memorial mass in celebration of Anna's life will take place in the church following the gathering at 9:45AM. The family would like to offer its most heart-felt thanks to the doctors, nurses, nurses aides and social workers of MGH White 10. Their kindness during this most difficult time was immensely appreciated.